Eastern Platinum Ltd. (TSE:ELR) (PINK:ELRFF) tanked more than 13% over the last couple trading sessions after traders and investors viewed financial results for the first quarter of the year. 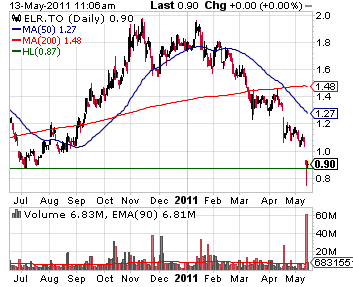 ELR stock price collapsed 13.5% and now sits right above a historical support at 87 cents. The heaviest trading volume for a three year period was recorded on Thursday when the price gapped down. Over 60 million shares traded hands then and today's growth also tops the average of 6.8 million. ELR had $349.7 million in cash by the end of the quarter. The management blamed the slow down on changes of stope support standards and the subsequent need to retrain underground personnel. Eastern believes that results will pick up over the coming quarters. New developments should also be anticipated - the company has arranged debt financing under which they can underwrite US$100 million financing package to be used to part fund the development costs of its Mareesburg Project.